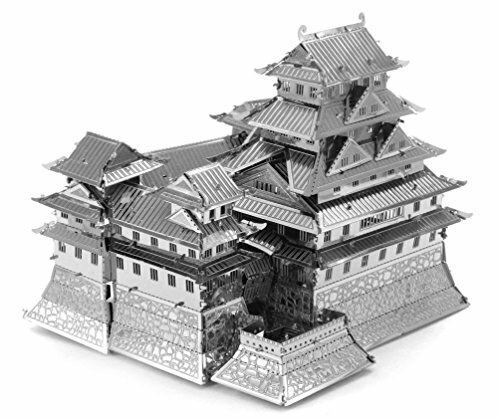 Architectural metal model kits are works of art that come unassembled for you to build. This form of art is put together through instructions. You only need a few tools if any. You’ll receive pieces of steel that are simply popped out of their frames and then shaped by you. The work consists of rounding panels, bending tabs and connecting pieces together. 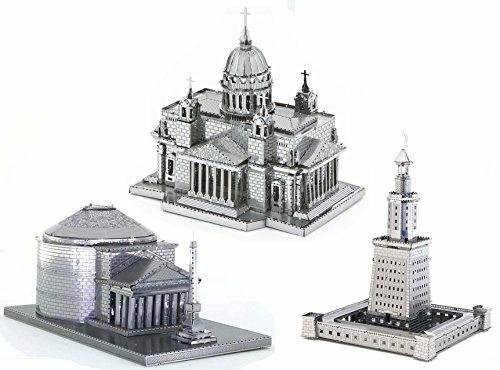 These miniature statues, of famous architecture from around the world, will erect as if each piece was glued together. Traditional architectural metal kits, however, don’t use adhesives and will require tweezers at most. Anyone with the patience and attention for detail has an opportunity to enjoy this calming hobby. This art form is based on collecting and then challenging yourself with the reconstruction of many of the world’s most prized architecture from the most outstanding nations. We brought together a list of the top ten metal kits on the market. You’re looking for something that will first meet your skill level; you can then progress from there. The more complicated a set is, the more delicate and detailed the pieces will be. Each kit should be made from stainless steel, and shouldn’t require glue for assembly. This infamous Moscow cathedral does more than catch the eye. The stunning colors and curvy motifs are part of a historic museum known as the Saint Basil’s Cathedral for the Intercession of the Most Holy Theotokos on the Moat. This Russian wonder was put into construction through the leadership of Ivan the Terrible. 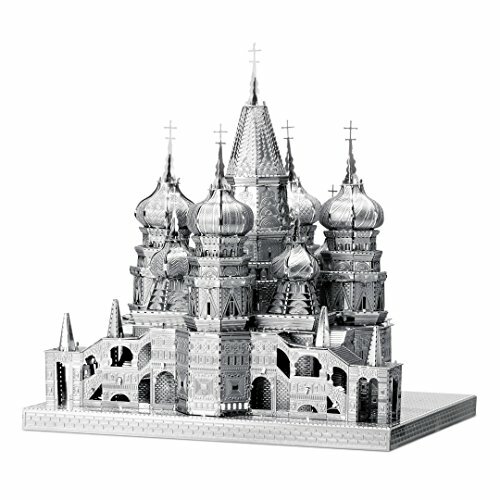 You can now work on it with your own skills and craftsmanship by creating a stunning metal replica of the Cathedral of the Vasily the Blessed. The 3D metal model of Saint Basil’s Cathedral comes in a finished size of 3.5” x 2.6” x 3.5” inches. It’s a puzzle in its own right. Each of the cathedral’s towers are completed with intricate crosses, and the building has its own platform. This is a platform that you must build on. The towers are the most notable features about the building. They are topped with pieces that require delicate care when bending into the right curvature. Russia’s Red Square is famous for this church and the rounded domes upon each tower. – This is a puzzle that you can enjoy as it will take time to complete. – It has clear instructions, and the work is managed by getting difficult pieces done first. – The model sits on a sturdy platform that gives the building just the right balance as a stand alone. – The domes and tops of this building are very fine pieces. – You’ll need to delicately work them and protect them from damage. This is certainly a piece that you’ll find entertaining and yet challenging. Consider a different model if this is your first time. Downtown Washington, D.C. is full of amazing architecture and captures a period in American history that great stories are made of. 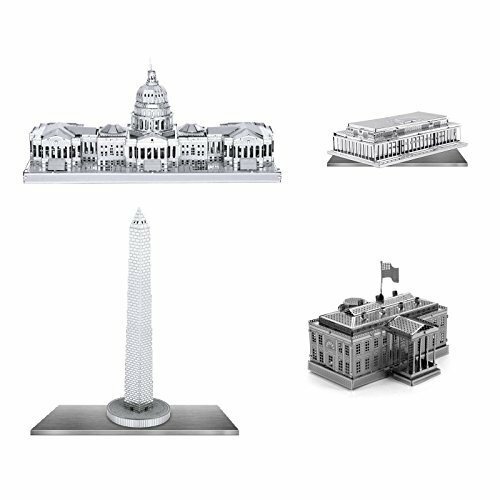 Here’s your opportunity to capture a patriotic essence with 3D models of the Washington Monument, the Nation’s Capital, the White House and the amazing Kennedy Center. This is a set that requires a variety of skills while you complete a full puzzle. The exact replica of these buildings come down to the finest details, but you should be able to manage the project with a slow and steady schedule. These are monuments that most people can recognize. They’re the perfect option for a living room display when you’re done. – This set comes with four models in one box. – You won’t need any glue and no hot melting. – Each building stands on its own platform. 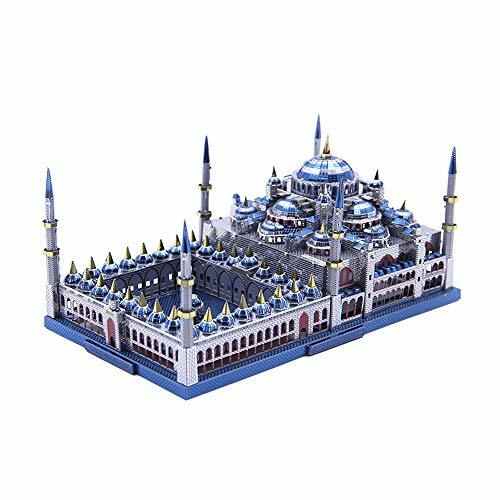 – Be ready to do the entire kit as one building does not come without the other. – The pop-out tabs need additional care and attention as they are delicate molds. Capturing a patriotic spirit or being productive is possible with this four-set collection. Plan your time accordingly, and don’t feel the need to rush. It was called Flavian Amphitheater, and it continues to stand in remembrance of the gladiatorial display of men in combat. The Roman Colosseum was also a place of dramas and plays. The stadium could hold up to 75,000 people, and it’s now being made into a metal model that fits into your hands. This package comes with illustrations that help you to find the right pieces along with the proper placement. There are two model sheets for this mold, and the simplicity of its design shouldn’t mislead you. This is a moderate challenge and has the ability to engage, for you will need to be precise. The best merit of this model is its simplicity. 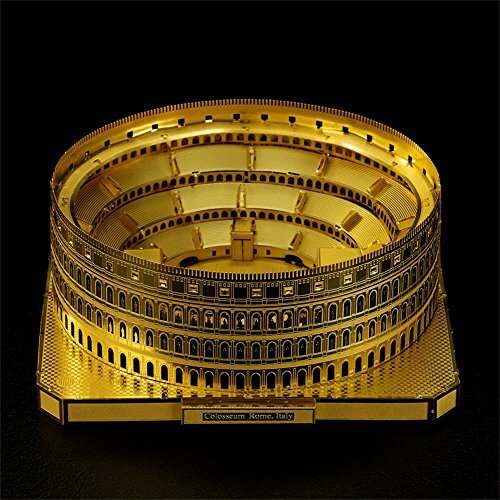 The colosseum was built in a way that amplifies sound, and this required an effective circular shape. Larger pieces of metal are used for this purpose. – Here’s a basic design that can still keep you entertained. – You get the chance to work with a 3.78 x 3.15 x 1.5 inch replica. – The panels are also etched to recreate and replicate pieces of stone. – No adhesives are necessary, but you will need a decent set of wire cutters. – Buyers found the final steps of assembly more complicated than the instructions suggested. We all recognize the rounded edges of the Colosseum. It’s astonishing that it was once heavily used by the Romans. This model gives you a chance to learn more about history while expanding on your 3D collection. Paris continues to inspire the world with its architecture as it seems to grab us with intrigue. A cathedral that often comes to mind in France is the Cathedral of Our Lady of Paris. This is the English translation for Notre Dame Cathedral Paris. The building captures a Gothic expression of the religious society during 1163. 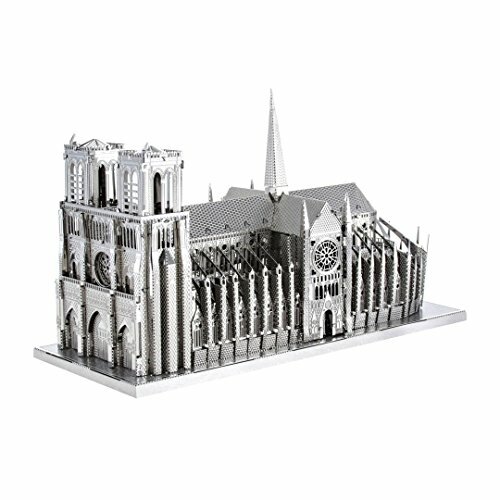 The replicated Gothic impressions of the Notre Dame Cathedral stand on a provided platform with very intricate details to keep you busy with. This 3D model invites in all of the difficulties of modeling that make the challenge worth it. You’ll accomplish this assembly without using glue and without a solder gun. The stunning features of this model are recognized through the external arches of the building. These arches move vertically and than back toward the cathedral. They can be found on both the left and right, elongated sides of the building. Each metal piece has been intricately crafted to capture the right texture and dimensions. – This project promises to give you a great sense of a job well done. – The details will capture you as you find yourself learning more about what was once prevailing, Gothic culture. – This model only weighs 0.8 ounces. – This is a very elaborate structure. – It’s not considered applicable for anyone under the age of 14. – It’s a popular model that often goes out of stock during sales. Expect to keep yourself busy with this structure and no matter your skill level. There’s a great amount of detail to put together. The Blue Mosque is known for its domes that are surrounded by rising towers with needle-nose points. You might find the model a bit of fun as long as you have the patience to assemble the pieces. You might even mistake the architecture as something from the Game of Thrones series. It’s beautiful architecture. There are five central dome structures that are followed by 14 domes of smaller sizes, and each extends downward from a top, central dome. The religious motif was built during the early 1600s with a spectacular blue shade that it became known for. This replica, however, is only 10.6 ounces when completed. The first thing you’ll notice is the coloration. It comes with a blue, metallic hue for dome pieces, a golden hue for decorations and red thresholds for the doors. The pieces are packaged as a standard metal model, but each are treated for anti-oxidation. This means that the colors will stick. – The color codes of this building are outstanding. – This model is a top-line jigsaw for major enthusiasts. – Expect to see greater detail for this structure than you’ll commonly find in others. – This might not be the best option for a beginner. – Be sure to use caution when assembling the long, narrow towers. A bit of fun can go a long way when working with a 6.3 x 15.8 x 9.5 centimeters of metal. Take your time, and see just how much you can be challenged. 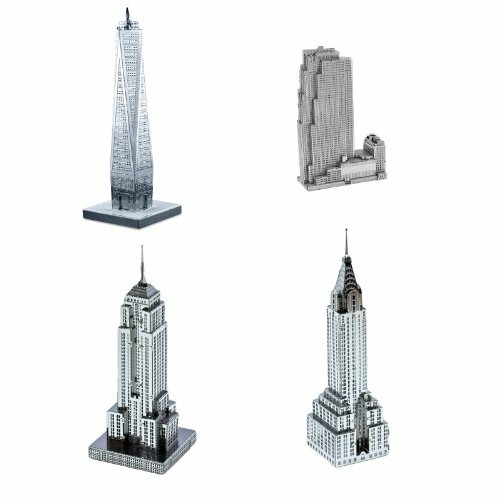 Your collection of metal architecture might not be complete without an entire ensemble for New York City skyscrapers. Special kits like this exclude the twin towers, but you’ll find the One World Trade Center in its place. The Rockefeller Plaza, the Chrysler and the Empire State buildings are also included. You’ll immediately have what is a strip of New York City after crafting these erected buildings. The pop-out pieces are easy to detach, and each piece has been specifically finished by a laser cutting tool. – There are no specific instructions on which building to assemble first. You can start in any order you like. – The laser cut pieces offer you finer details and straighter edges. – Customers found it difficult when returning this item. – Some were packaged with duplicates of any given building. A collection of art like this is a great way to start a new hobby and to learn more about metal architecture. Here are relatively simple structures to begin with. The Himeji Castle is one of Japan’s greatest achievements. It stands without ever being taken by a military force. It continues to stand on a pleasant hill, and its design is now the source of inspiration for this metal architecture model. The sturdy platform the castle actually stands on is also portrayed in this replica. The structure, when complete and done, is very compact until you take a closer look. The real castle is built on a stone wall that serves as a platform, and this feature is also present within the details of intricate stone work. You need to form each piece properly, yet they are all made from durable steel. The details of this castle are found within its interesting roof. This design uses a common Japanese pattern that curves at the tip in an effort to chase away evil spirits. You will find this feature as a slight bend of metal and an exact replica of terracotta tile. – Here’s a challenge for the experienced craftsman. – Instructions provided are in-depth and detailed. – This may turn out too much for the beginner. – You need the right amount of time no matter what skill level you have. Approach this project with a steady pace, and you’re sure to get through. Being one of the more complicated replicas, it will also help to read the manual a number of times before getting started. Here’s a rare collection that covers a large stretch of the world. Each item can found within a different country. Alexandria’s lighthouse was built in Egypt during Ptolemy’s empire that was erected at the death of Alexander the Great. St. Isaac’s Cathedral is a building founded on different religious views and is instead located in Saint Petersburg, Russia. The Roman Pantheon is a famous temple built around 126 AD and stood as the largest building of its kind in that period. Each piece has been made with fine details through a laser cutting process. You’ll quickly notice that the walls have life-like brick where each stone is neatly put in its place. The next step will be for you to complete the instructions as provided. – Quickly collect much of the world-monuments within this box set. – This set allows you to really get started or to expand the architecture models you have. – You may find this set to have the smallest pieces, and that can be a real challenge if this is your first attempt. – Be sure to take each model apart one at a time, and you won’t mix up pieces. There are no elaborate tools required to assemble this set. The box holds favorite structures from history. It’s enough to build a collection with over time. This American icon was erected in the city of Seattle and acts a lighting rod in the city’s storms. The name of the structure is called the Space Needle and was designed to endure impressive winds with unexpected earthquakes. The building enjoys over 20,000 visitors everyday and has become synonymous with Seattle. With a one-sheet, steel kit, the Space Needle may be the easiest item to assemble on this list. It will continue to the be the tallest out of your collection and requires very few steps to build. You’ll immediately see how well this model has been replicated. 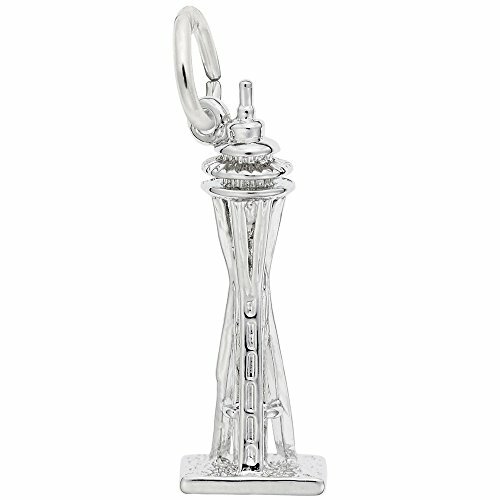 The elongated body of the Space Needle only takes a few pieces to construct. This set even comes with the appearance of people watching the views from their heights above. – Here’s a very easy model to work with. – No glue or welding is necessary. – Think about how much you want to be challenged. – This piece can surely add to a collection, but you might not be maximizing on your building potential. The Seattle needle is a fun structure with a physique we all recognize. Make a statement, and enjoy the satisfaction of a job well done with this metallic replica. London’s Big Ben goes down in history as a clock tower with four faces that spans over 20 feet per ticking dial. The clock was built in 1859 and has been an English landmark since. The 13.5 ton bells within the tower were the largest of its kind. It now stands with worldwide notoriety. This British icon fits right in your palm with dimensions of 5 x 2.4 x 3 inches. This is a very detailed model, and there are a lot of precision pieces that will need to be perfected before they’re added to the entire stand. Its level of detail makes this metal replica a stunning portrayal. – All of the pieces can be assembled without any special tools. – Test your craftsmanship with a intricate design sure to keep you busy. – This model comes with small pieces that have to be kept away from children. – Be sure to bend panels to a full 90 degrees to maintain the straight-edge, Gothic appearance of Big Ben. A true collection has to be diverse. It helps to be inspired by architecture the whole world recognizes. Consider adding Big Ben to your collection, and visit back here for more options.